Born in Worcester, Western Cape, Kramer lives and works in Cape Town. He graduated with a Fine Arts Diploma from Michaelis School of Fine Art, University of Cape Town in 1968. In the early 1970s Kramer began to record small-town shopfronts, corner cafés, bioscopes and general dealer stores with his camera, fearing they might soon disappear. The supermarket was coming to town and television was about to make its presence felt. He wanted to hold onto the memory. He realised that these ordinary buildings that he had grown up with, meshed with his idea of doing something essentially South African. This idea crystalised after his first overseas trip to Europe in 1974, when upon his return, he realised how bizarre and extraordinary the local townscape was. Influenced by the photorealism movement of the time, he began to use his photos as a subject for his deadpan realistic paintings. 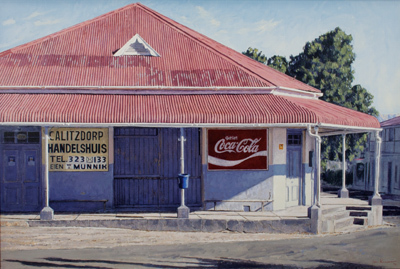 "Concentrating on light and shadow, tonal values, verticals and horizontals, and by eliminating any present living beings from my paintings, I wished to create art works that said something about the 'real' South Africa."